Celebrating Valentine's Day usually means a romantic dinner out, chocolates, and red roses. That's always appealing, but another way to make it special is to plan something a bit more unusual to mark the day. Here are some ideas that might knock the socks off your partner for Valentine's Day 2019 in the St. Louis area. 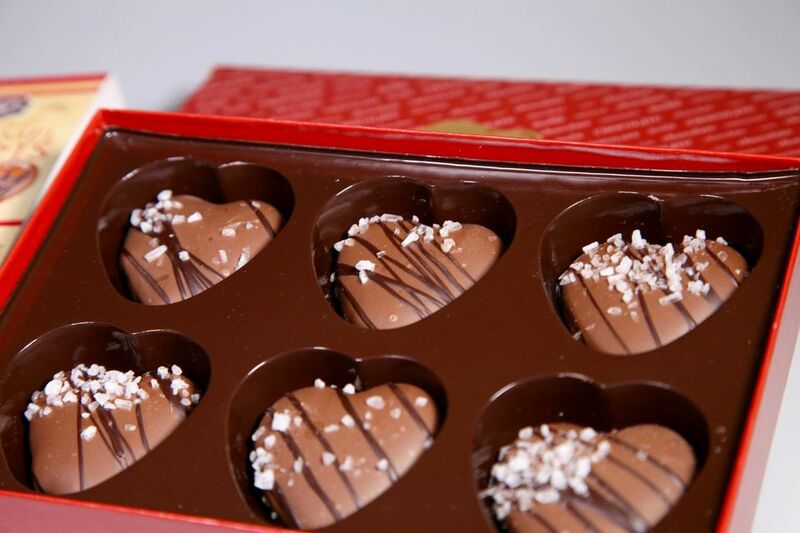 If your valentine is a chocolate lover, don't just give him or her a heart-shaped box; go on a tour of the Chocolate, Chocolate, Chocolate Company at Interstate 44 and Kingshighway. During the hour-long tour, guests will get an up-close look at the factory floor and be able to smell, taste, and see the candies as they're made. Open Monday through Friday 9 a.m. to 2:30 p.m. and offering private reservations on Saturdays from 9 a.m. to 1 p.m., the Chocolate, Chocolate, Chocolate Company factory offers free tours six days a week. Reservations are not required for weekday tours, but lines can get quite long during the holiday season so it's recommended you book your tour in advance anyway. Cook up some romance with your sweetheart at a cooking class for couples at the Kitchen Conservatory in Clayton. For Valentine's Day, you can learn to prepare a special meal with your special someone. The class will make a special meal of crab fritters with red pepper ketchup, lobster corn chowder with parmesan cheese straws, red wine poached pear salad with goat cheese and pistachios, and seared scallops on lobster risotto. For dessert, you'll also learn to make (and enjoy) a hot chocolate souffle with caramel cream. On Saturday, February 2, 2019, from 10 a.m. to 4 p.m., you can take your special someone on an exclusive tour of the businesses of Sainte Genevieve, which is located about an hour's drive south of St. Louis. This annual fundraiser for the Sainte Genevieve Downtown Renewal Project invites just 300 guests to venture between local shops around town to collect delicious pieces of chocolates. The Chocolate Walk will start at the Audubon's Grill and Bar (9 North Main Street); tickets are required in advance, and the event is likely to sell out. Although the Fabulous Fox Theatre won't have a special show on Valentine's Day this year, there are still plenty of opportunities to see some great entertainment around in February. In 2019, a regional production of "Fiddler on the Roof" will be performed from January 29 to February 10, and from February 22 to 24, the theater will be hosting a tribute to the Rat Pack called "The Rat Pack is Back." Grab a ticket to either show for a special treat for your Valentine's this year—even if it misses the date by a week or two, it's the thought that counts! St. Louis's historic Lemp Mansion is serving up a special Valentine's dinner for two on three special nights over Valentine's Day weekend this year. When it comes to intimate dinners, a setting can't get more romantic than this, and the four-course meal here includes champagne and a treat for each couple. Reservations are available for February 14, 15, and 16, 2019, and the Knez Jakovac Duo will be performing from 6 to 9 p.m. on each evening. The special menu features shared appetizers, two Lemp dinner salads, two entrees from the Lemp Mansion menu, a special dessert for two, and unlimited champagne. Dust off your dancing shoes, grab your partner, and head over to the legendary Casa Loma Ballroom for a Valentine's Day celebration on the weekend of Valentine's Day. On Thursday, February 15, you can join Cornet Chop Suey for a special Valentine's swing dance and on Friday, February 16, you can don your finest mask and attend the Vices and Virtues Masquerade Ball presented by Soulard Restoration Group. Other great performances happening in February include Sweetie and the Toothaches on the 8th, The Fabulous Motown Revue with the Progress Band on the 9th, and Miss Jubilee and the Humdingers on the 22nd. If you both love jazz, spend Valentine's Day at one of St. Louis's premier jazz clubs. Jazz at the Bistro in Grand Center welcomes rising artists for an evening of modern vocal jazz February 14 through the 17, 2019, and each evening will feature two sets. Other great venues worth checking out include BB's Jazz, Blues, and Soups; Thurman's in Shaw, and the Guage Cigar Club. Spend time with your Valentine in Missouri Wine Country at a port tasting and dinner at Mount Pleasant Winery. On this special evening, you and your loved one will be treated to a sampling of six different ports accompanied by appetizers. Then, you'll enjoy a three-course dinner of Pasta e Fagioli, beef medallions, or scallops, and double chocolate torte for dessert. A live band will also perform during dinner, and you can book a reservation for the dinner and port tasting separately or together. However, this event is limited to 40 people, so book your spot as soon as possible. Pere Marquette Lodge in Grafton, Illinois, is a romantic spot any day of the year, and its Great Room, which includes a huge fireplace, is a prime location for a cozy Valentine's Day celebration. On Valentine's Day 2019, there will be live music from 6 to 10 p.m. in the great room, and guests can enjoy a glass or two of wine to celebrate the occasion. You can also enjoy a special dinner in the adjacent dining room if you'd like, but reservations are required. While the always cool Blueberry Hill is usually a great spot to catch a live show, you can do something a little different this Valentine's Day when this famous venue will host a romantic evening of love song karaoke. This free event (drinks cost extra) will start at 8 p.m. on February 14 and everyone is welcome to attend. Song choices are limited to love songs or breakup songs, and KJ Sheel, who hosts the event, will also perform a few songs throughout the night. You can't put on the Ritz for Valentine's Day any more authentically than at, yes, the Ritz-Carlton in Clayton. Stop in for an evening of cocktails and music in the glam Lobby Lounge, which serves light appetizers and has a drink menu featuring more than 200 martinis. If you're in town over Valentine's Day weekend, the Lounge also features live music on Friday and Saturday nights from 9 p.m. to 12:30 a.m. and you can enjoy a sushi bar there daily from 5 to 9 p.m. Although it might not be the first thing that comes to mind when you think of a romantic meal, the fast food chain White Castle is serving up a special Valentine's meal complete with candles, tableside service, and romantic decor. Money can't buy love, and you don't need to drop a bundle to celebrate with your honey. Dinner will be served from 4 to 9 p.m. on February 14 at all local White Castle locations. However, you do need a reservation; call ahead or make it at Open Table. If you're looking for a great activity no matter what time of the month you visit, you can stroll through the Missouri Botanical Garden's annual Orchid Show, which runs daily throughout February and March from 9 a.m. to 5 p.m. The Orchid Show features exotic flowers from around the world in a naturalistic tropical setting. You can spend hours wandering the grounds of the botanical gardens, and afterward, you can buy your date an orchid in the Garden Shop. February is all about Beethoven at the St. Louis Symphony; throughout the month, you can catch performances of his Seventh and Ninth symphonies on February 7, 8, 9, 15, and 16, 2020. Other performances in February include Tchaikovsky's "Sleeping Beauty" conducted by Nokolaj Szeps-Znaider and "Life Every Voice: Black History Month Celebration" featuring the IN UNISON Chorus.